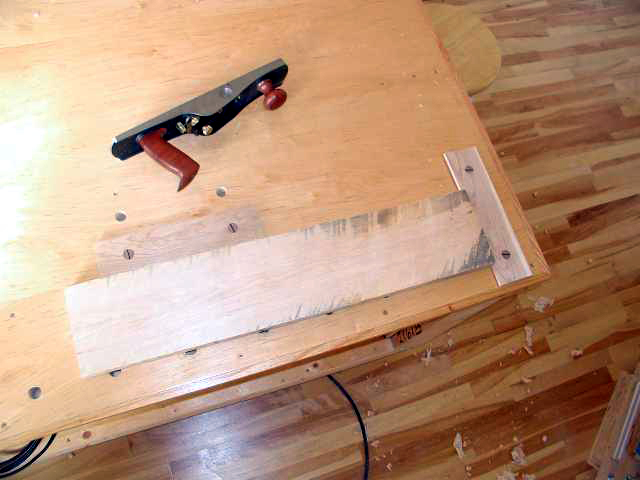 This alternative tail-vise setup is used when face planing boards. 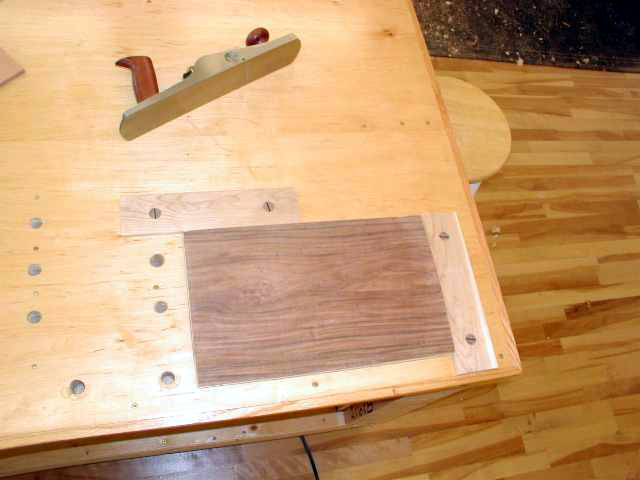 Most flat, regular benches can easily be modified to incorporate this hand planing setup using bench stops ( Roubo style). 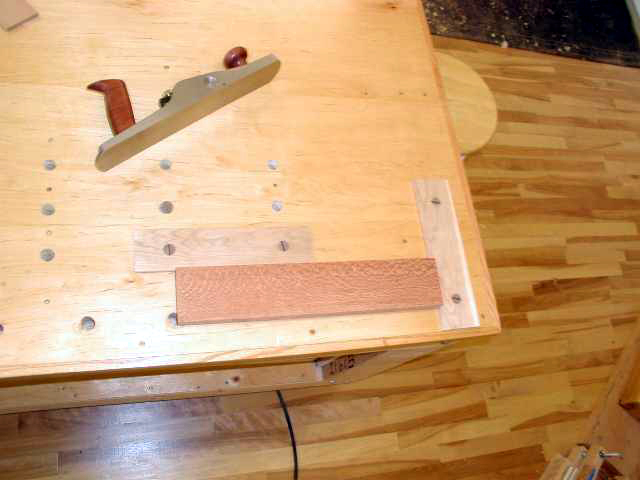 Photos below are of the bench stop setup on the workbench in my workshop. This bench has been modified for adapting the two bench stops. 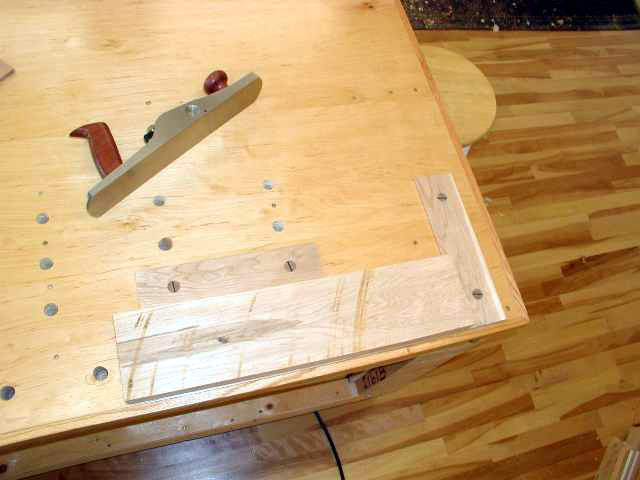 Adapting a bench can be expanded for longer bench stops, more holes for versatility, etc. I chose this particular hole spacing for the type of work I do. I am also left-handed and plane left to right, therefore I set this up on the back side of my bench which is unencumbered by a face vise ( the face vise at front of bench ). It is critical to get the 3/4 in. 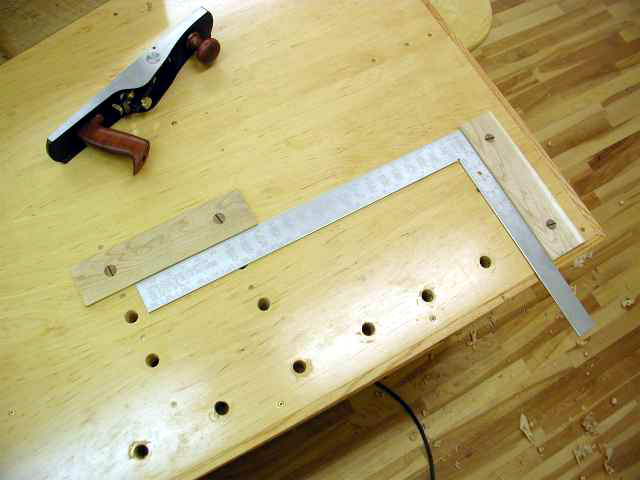 dowel holes square to the bench and in-line with each other, to ensure that the 12 in. bench stops are perpendicular to each other. The side bench stop does a great job of preventing the board from rotating sideways while hand planing with diagonal strokes. It has a large bearing surface to keep any size board from rotating. The side bench stop is also movable within a 12 in. 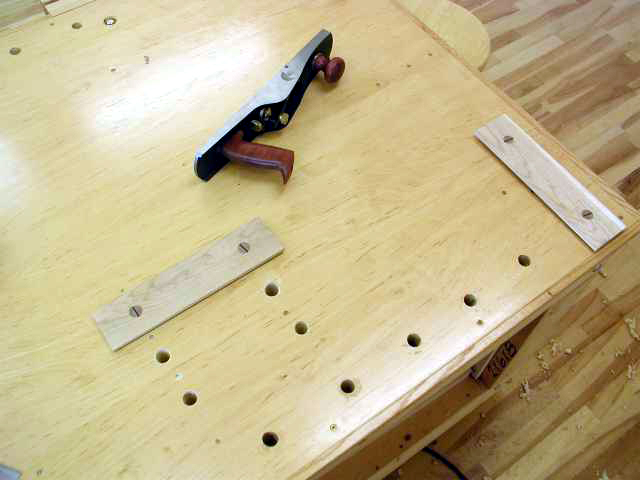 span on 3 sets of holes, allowing for narrow boards and wider boards (2 in. to 14 in.). The wide front bench stop also serves to prevent the board from rotating or shifting sideways as it has a large bearing surface for the front edge of the board. 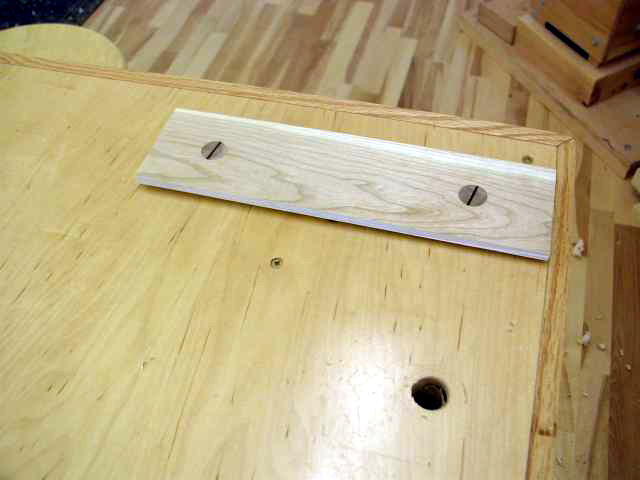 Bench stops (front and side) are friction fit so they can be raised (1/4 in. to 3/4 in.) to accommodate thicker boards, very much like a bench dog. Otherwise, the minimum height of the bench stops would be approximately 1/4 inch. The hole spacing is arbitrary and based on the type of board sizes I typically hand plane in my own furniture making. two inch long birch dowels are glued in the bench stops using ebony wedges. The wedges are inserted into kerfs created in the ends of the dowels for tightness. 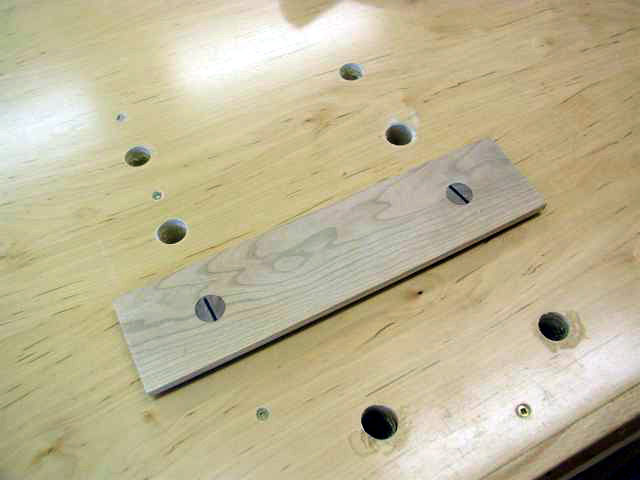 Kerfs at the ends of the dowels are cut on a bandsaw. The bored 3/4 in. 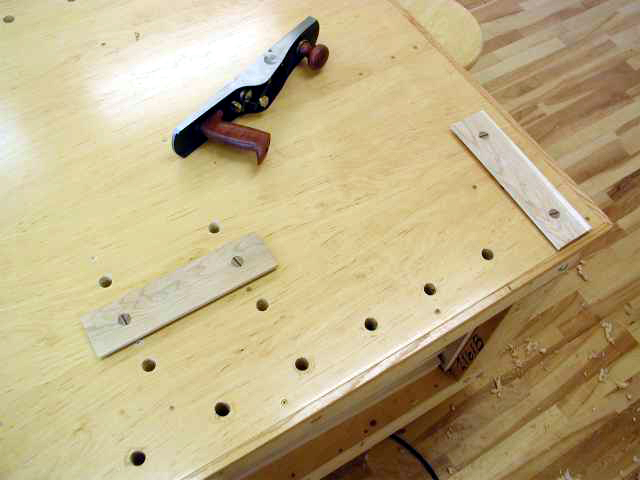 holes can also be used for bench dogs and holdfasts for irregular sized pieces.